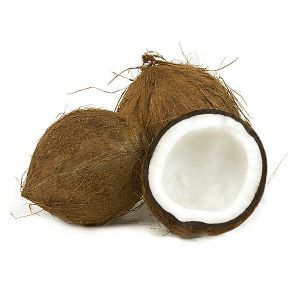 The most common variety of coconut in markets is the dry coconut, which is characterized by a hard brown shell with a stringy, hairy appearance that surrounds the flesh, which can be soft or hard, colored white and sweet. Coconuts also contain a translucent sweet and milky liquid called coconut milk, which can also be utilized in a number of ways. They are shaped round to oval and reach sizes up to 15 inches long and 12 inches wide. Dry Coconuts are used often in cooking, ice cream, desserts, etc. In fact, Thai cooks use coconut milk as a marinade/flavoring for meat and chicken dishes. Soft flesh is best eaten fresh. Hard flesh can be dried or may be refrigerated. Coconut milk is best used fresh. Source: Central and South America and the Caribbean. Handling: Fresh fruit ready to eat. Cut into cubes, sliced or grated. Often used in cooking ice cream and other desserts. Up to 6 months shelf life (refrigerated).